Yes the Logger's Retreat is gone! It was most likely the very first of 17 structures lost in the Railroad Fire of 2017. This is of course a terrible loss, but we will rebuild! Visit our Rebuild Pages to learn about the history of the Logger's Retreat before, during and after the fire. For posterity's sake, we've preserved most of the rest of this website as it was, immediately before the Logger's Retreat was destroyed. Located above Highway 41 and just minutes from Yosemite's southern entrance, our comfortable, family-friendly modern mountain home offers a convenient yet private retreat with stunning mountain views, luxurious clean living spaces, and even the nostalgic sounds of the nearby Yosemite Mountain Sugar Pine Railroad. 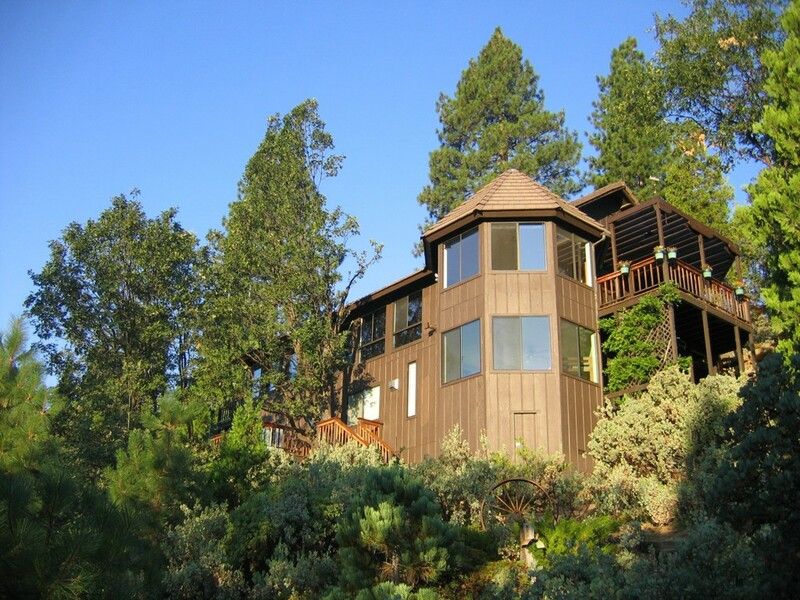 The Logger's Retreat overlooks the upper reaches of the Lewis Creek watershed at an elevation of nearly 5000 feet. In the summer, the climate here ranges from comfortable daytime highs that average in the upper 70's (~25 degrees Celsius), to cool evenings with average lows in the low 50's (~10 degrees Celsius). At this elevation the sun is intense all year round. There is nearly always a gentle breeze blowing during the day. There is very little or no rain during the summer months so humidity levels are very low and swimsuits air-dry quickly. Spring and early fall are the seasons of dynamic color and wetter weather. Late fall, winter and early spring are quiet seasons of incredible beauty. Along with this beauty comes the possibility of ice and snow on mountain roads and on our driveway. Use the Explore button above to discover more about visiting our one-of-a-kind historic home. Use the Reserve button to check availability, to inquire and to reserve it.